Jaume Collet-Serra (Catalan pronunciation: [ˈʒawmə kuˈʎɛt ˈsɛrə]; born 23 March 1974) is a Spanish film director and producer. He is known for directing the horror remake House of Wax (2005), Disney soccer movie Goal II: Living the Dream (2007), the psychological horror Orphan (2009), the Liam Neeson action-thrillers Unknown (2011), Non-Stop (2014), Run All Night (2015) and The Commuter (2018), and the survival horror-thriller The Shallows (2016). Collet-Serra was born in Sant Iscle de Vallalta, Catalonia, Spain. Soon after graduating, he began his career as an editor before moving on to direct music videos and television commercials for companies such as Sony, Budweiser, and Verizon. In 2005, Collet-Serra was given an opportunity to direct his first feature film by producer Joel Silver (The Matrix). The film, House of Wax, was a remake of the 1953 original of the same name. Despite reviewers giving the film a negative critical reception, it was a financial success, and starred Elisha Cuthbert and Chad Michael Murray and featuring Paris Hilton. Two years later, Collet-Serra directed Goal II: Living the Dream. The film, the sequel to Goal!, finds star European soccer player Santiago Muñez (Kuno Becker) bumped by his agent (Stephen Dillane) from England's Newcastle United team to Real Madrid's Galácticos. He reunited with producer Silver for the third film of his career, Orphan, a 2009 American psychological horror film starring Vera Farmiga, Peter Sarsgaard, and Isabelle Fuhrman. The film centres on a couple who, after the death of their unborn child, adopt a mysterious nine-year-old girl. Orphan was produced by Joel Silver and Susan Downey of Dark Castle Entertainment and Leonardo DiCaprio and Jennifer Davisson Killoran of Appian Way Productions. The film received mixed critical reviews but was a box office success. Collet-Serra then directed Unknown, a 2011 British psychological thriller starring Liam Neeson, Diane Kruger, January Jones, Aidan Quinn, Bruno Ganz, and Frank Langella. The film is based on the 2003 French novel published in English as Out of My Head, by Didier Van Cauwelaert. Collet-Serra made his television directing debut with the ABC pilot The River, a horror drama from Paranormal Activity writer-director Oren Peli. The show was met with generally favourable reviews. In December 2012, he began filming for his next film Non-Stop, which starred Liam Neeson and Julianne Moore. Collet-Serra formed his own production house Ombra Films. With money from StudioCanal, the small company set out to make low-budget English-language horror films, with an eye toward launching the careers of up-and-coming Spanish filmmakers. Juan Sola, Collet-Serra's producing partner, told Deadline Hollywood, "We've seen how many talented directors are coming out of Spain, but there hasn't really been a platform for them to find work in films. They look up to Jaume as a guy they want to become and we thought, how about a company that creates a bridge between Spain and the U.S., similar to what Luc Besson provided in France? Already, we are being bombarded, and we feel directors will find Ombra a fantastic platform. Jaume loves mentoring new talent." The venture's first film was Mindscape, a psychological thriller about a man with the ability to enter people's memories, starring Taissa Farmiga, Mark Strong, and Brian Cox. Collet-Serra executive produced the found footage comedy-horror film Hooked Up, which was directed by Pablo Larcuen and was shot on an iPhone. Collet-Serra directed and executive produced The Shallows, a 2016 horror-thriller starring Blake Lively, from a script by Anthony Jaswinski, and The Commuter, an action-thriller starring Liam Neeson, which was released on January 12, 2018, and also features Vera Farmiga, Sam Neill, and Elizabeth McGovern. He has signed on to direct Jungle Cruise for Disney, starring Dwayne Johnson and based on the attraction of the same name at Disneyland. ^ Diane Garrett, Tatiana Siegel (29 November 2007). "Sarsgaard, Farmiga join 'Orphan'". Variety. Retrieved 29 May 2008. ^ "Unknown White Male Starts Principal Photography". MovieWeb. Retrieved 21 February 2011. ^ Dargis, Manohla (17 February 2011). "Me, My Doppelgänger and a Dunk in the River". The New York Times. Retrieved 18 February 2011. ^ Mark, Steven (3 June 2011). "ABC to move 'The River' filming to isles". Honolulu Star-Advertiser. Retrieved 24 August 2011. ^ "The River: Season 1]". Metacritic. 7 February 2012. ^ "'Non-Stop', starring Liam Neeson, filming in NYC". On Location Vacations. 10 December 2012. Retrieved 11 December 2012. ^ "Silver Pictures Picks Up Remake Rights to French Heist Film 'Le Convoyeur' (Exclusive)". The Hollywood Reporter. 4 December 2012. Retrieved 14 December 2012. 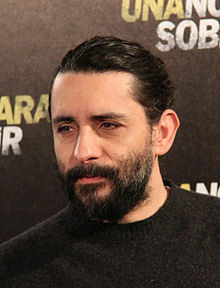 ^ "Jaume Collet-Serra set to produce psychological thriller 'Mindscape'". Joblo. Retrieved 20 January 2013. ^ "Hooked Up". DC. Retrieved 20 January 2013. ^ "Hooked Up". Joblo. Retrieved 20 January 2013. ^ "Sony's 'The Shallows' To Shoot In Australia". Variety. Retrieved 5 November 2015. ^ "Jaume Collet-Serra Reunites With Liam Neeson On Studiocanal's 'The Commuter'". Deadline Hollywood. Retrieved 29 January 2016. ^ "Jaume Collet-Serra To Direct Dwayne Johnson In 'Jungle Cruise:' No 'Suicide Squad 2'". Deadline Hollywood. 31 July 2017. Retrieved 31 July 2017.